What if I told you you could get your money’s worth from Leadpages without ever building a landing page? If you’d just shrug and nod, then you’re probably already making excellent use of one of our platform’s most powerful tools: Leadboxes. Even people who build lots of landing pages sometimes don’t realize all they can do with these flexible two-step opt-in forms. And while it’s super easy to set up Leadboxes from within any Leadpages landing-page template, no savvy marketer should be stopping there. Plus, while all Leadboxes are set up to convert well even if you don’t change any of the default settings, we’ve seen many people achieve astounding conversion-rate gains by doing a little careful customization. In this master post, I’m going to break down exactly what Leadboxes do, how they do it, and how you can use them to get more opt-ins for your business. There’s a lot here, so you may want to bookmark this page to consult any time you want to optimize your Leadboxes. What Are Leadboxes and Why Do They Work? LeadPages’ landing page templates didn’t always look the way they do today. Some of the early pages had opt-in forms embedded right on the page. A couple years ago, we began studying the effect of turning these “taking pages”—that is, pages that made an immediate and obvious grab for visitors’ contact info—into “giving pages.” Once we saw the results, we knew we had to make a big change. When we required visitors to click a trigger button in order to view an opt-in form, we found that our landing pages routinely got about 30% more effective at capturing leads. We called the opt-in forms we created Leadboxes, and they’ve only been getting better since then. Why does placing a barrier in front of the form actually get more people to complete the form? There are several psychological factors in play. In order to find that one-step opt-in form above, I had to do some digging. Not because one-step forms are all that uncommon. Quite the opposite. Most of us have seen so many form fields on so many pages by now that we can pass them by without really registering that they’re there. I knew they were out there . . . but I had trouble calling any particular form to mind. Not a great sign. Then, too, people have also become more and more wary of sharing their information online, and it can feel psychologically risky to type in your contact information “out in the open.” Many people are unlikely to do that spontaneously. But ask as part of a well-defined process and you create a stronger—and potentially reassuring—context for the request. Today, every Leadpages membership allows you to create unlimited Leadboxes to collect unlimited opt-ins. To get inspiration from dozens of Leadpages members’ lovely Leadboxes, browse our archive of monthly LeadBox™ roundups. How Do I Set Up a LeadBox™? You can build Leadboxes from inside a Leadpages landing-page template or on their own. To start building one within a template, simply click on any call-to-action button while you’re working in the builder. 1. First, select an integration—that is, the service you want to receive the data that the LeadBox™ will collect. This could be an email service provider, a webinar-hosting platform, or . . . you. If you select Lead Notifications, you’ll simply receive an email with the data your leads provide every time someone opts in. Otherwise, you’ll also need to select the list you’re adding your leads to in the service you’re integrating. 2. If you’re using your LeadBox™ to offer a free report or another kind of lead magnet, you can choose to have it automatically sent to your leads by turning on Lead Magnet Delivery. Choose one of the assets you’ve uploaded to your Lead Magnet Delivery library (or save, name, and close your LeadBox™ and go upload a new one; you’ll find this area under your main account menu at the right). Choose “Send An Email After Someone Opts-in” and select your lead magnet from the dropdown menu. 3. Decide what kind of information you want your form fields to collect. Your integration service may specify the available fields. If your visitors have filled out another LeadBox™ anywhere on the platform, their information can prepopulate in these fields to make conversion even easier—or you can turn on Facebook Registration to pull in info from visitors who are also logged into Facebook. 5. Choose a thank-you page, or save and close your LeadBox™ and create a new thank-you page just for this offer, then come back and add the URL. This completes what we call a Micro Funnel—see our funnel-building guide for more on this concept and why it’s so important to your marketing campaigns. Standard LeadBox™: This is simple: you click and the LeadBox™ pops up. But you still want to choose what your visitors click. You can link your LeadBox™ to a regular snippet of text, to an image you upload, or to a basic button you create within Leadpages. Pop-up LeadBox™: You can also choose to have your LeadBox™ appear automatically after a certain number of seconds and/or pageviews. A timer allows people to dismiss the box and not see it again for a number of days you choose, so you won’t risk annoying regular visitors. Exit LeadBox™: When a visitor moves to exit your page, you can make one last effort to give them what you’re offering with an exit LeadBox™. What Can I Use Leadboxes for? Just about anything that requires an online signup. (One caveat: although we’re always adding integrations, you can’t currently use a LeadBox™ to process credit-card payments.) You can use LeadBoxes to offer . . .
To see how entrepreneurs have worked Leadboxes into their larger marketing strategies, check out our case studies on business coach Shannon Lavenia and e-learning consultancy LMS.org. Where Can I Use Leadboxes? Leadboxes are fully compatible with mobile viewing, though they will appear in a new window. Visitors who dismiss the LeadBox™ window will automatically land back at the original page. If you don’t want this kind of mobile experience, however, you can suppress your LeadBox™ when your landing page is viewed on a mobile device. Because businesses tend to see exponential conversion increases as they increase their number of conversion opportunities—indeed, studies suggest there’s still room for massive improvement even after you hit 40 or 50 opt-in points—it’s worth using every avenue. 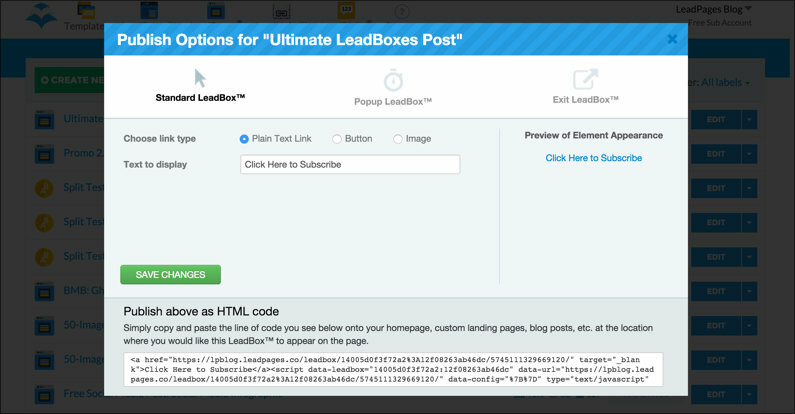 To trigger a LeadBox™ outside your landing page, simply copy the code from the Publish box and paste it wherever you want the LeadBox™ to appear. Form fields: Avoid collecting more information than you’ll actually use, since in most cases more form fields mean fewer opt-ins. But not always. If it’s important for you to project authority or security, visitors may feel more confident in you if you ask for a little more info. Call-to-action button: A vivid color and a snappy message put the “action” into a call-to-action button. As with the headline, it’s often best to focus less on what visitors need to do (“CLICK HERE”) than on what they’ll get (“DOWNLOAD THE GUIDE”). Image: Our default download icon performs well, but you can typically get even better results with a custom image. Consider using an illustration of what you’re offering, a high-quality stock image, or even a photo of yourself. How Can I Get Unlimited Leadboxes? Just sign up for any Leadpages membership. At every level, you can create unlimited Leadboxes to capture unlimited leads on unlimited sites. Click here to assess which membership option is right for you. Have any lingering questions about Leadboxes, or any success stories to share? Tell us in the comments!